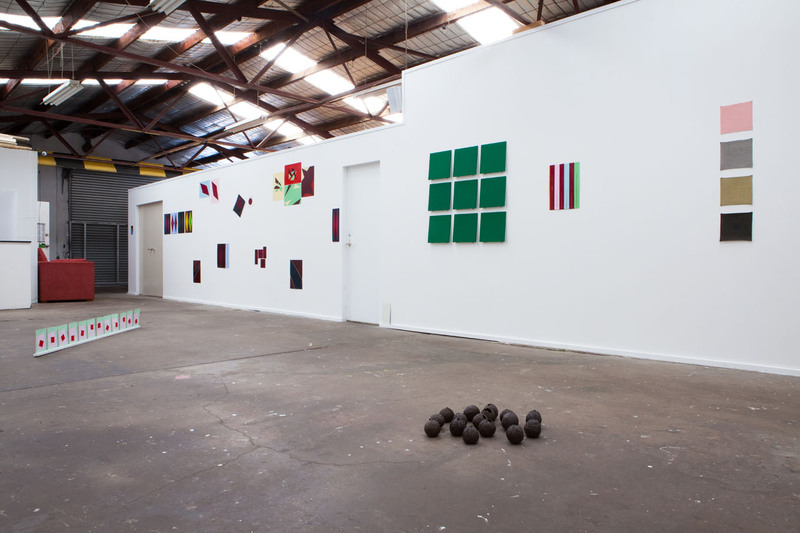 This text is the result of a three week installation/exhibition held at INDEX., an artist run initiative in St. Peters, Sydney. The directors of INDEX. Alex Wisser and Georgina Pollard, and the artist Melanie E. Khava laid out 9 years of the artists work on the floor of the space and spent an entire week discussing and selecting work for a final exhibition. This text is my response to the experience and the artwork I was privileged to encounter in such a sustained and intimate manner. When we spread the inventory of nine years of Melanie’s E. Khava’s artistic production on rows of white paper across the gallery floor, the immediate, intuitive impression I had of it was a sense of snow. Certainly this was not about the whiteness of the work, which was overpowering in the volubility of its color. Instead, I realized, it was the quietude of the work, as its cold, even crystalline silence recalled for me the smell of snow, especially when it is only a potency in the air. It was a surprising impression, considering the riot of form and color that produced it. 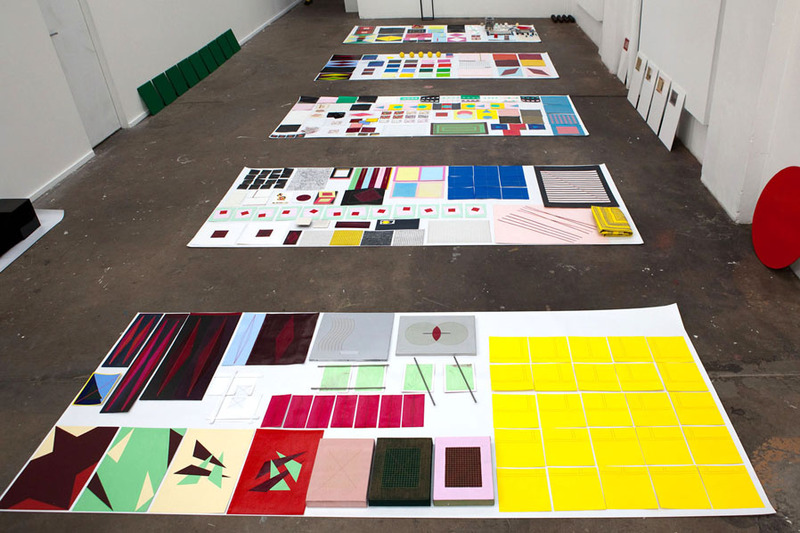 When taken in survey, the body of work presented a formidable field of view, a brilliantly colorful array of predominantly geometric forms, at once anarchic and regimented within the grid of white rows on which it sat. Though I knew of the quietude of Melanie’s work when viewed in isolation, it was surprising to encounter it through the cacophony of its informal and cumulative treatment on the floor of the gallery. By all rights it should be yelling at the top of its lungs and yet the main impression was one of silence. If we look at the work more closely though, we soon discover that the nature of this silence is far more fascinating than the surprising fact of it. At first approach, it often presents an intensely care inflected surface, predominantly made on paper painted in numerous painstaking layers and sanded to a smooth consistency. The forms are methodically drawn, often with a light touch, sewn, punctured or cut, both literally into the surface of the paper, and figuratively in precise paint work. The use of color is often cheerful or soft: light blues and bright yellows, subdued greens and pinks, combine to produce intimate objects of hard-edged abstraction with domestic overtones. The consistent use of stitch and thread work, the layers and layers of applied paint, painstakingly smoothed, and the delicate precision of its execution, invests each object with the sustained care of its making, remarking the intimacy of touch required by its process and the handled nature of its production. Given its non objective, often hard edged content, this intimate, hand crafted, even “lovingly made” work conflicts with itself and the description I have given (even as I give it) appears to me completely inaccurate and misleading. Take for instance one striking work made up of light yellow, pink, green and blue hard edged forms created through intersecting diagonals. From this surface, three circles have been cut out, painted different colors, criss crossed with black thread and sewn back into place. The colors you cannot describe as anything but “cheerful” and yet they combine with the extreme flatness and sharp edged purity of the forms to generate an effect of anxious severity; bright, cold, and hard to the point of being impenetrable. This is emphasized by the fact that the work is literally penetrated: through the use of cutting, but also through the puncturing of the needle that sews the cut material back in to place. These penetrations give nothing. In demonstrating the paltry 3rd dimension or literal depth of the paper, they only amplify the unforgiving flatness of the picture plane, denying any of the consolations of depth, any sense of ‘give’ in the surface. In fact, far from ameliorating the cold ideality of the surface, these penetrations produce an undeniable effect of violence. 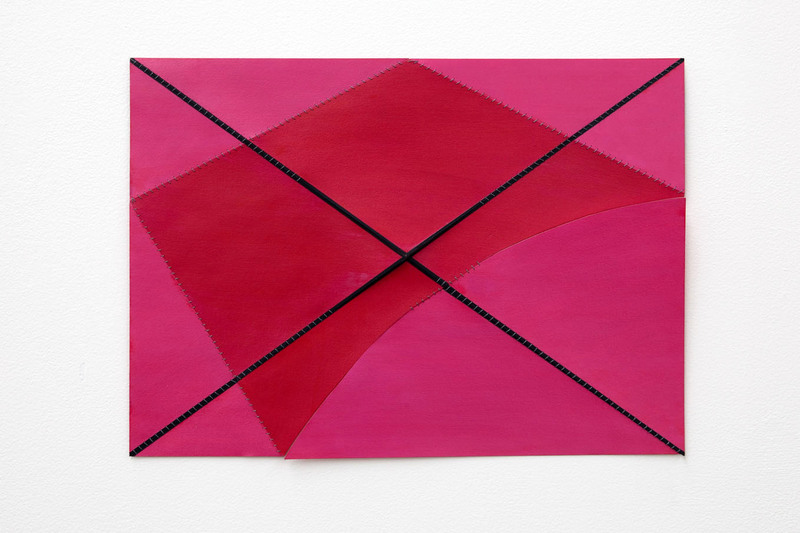 The cutting of the surface is only exacerbated by the suture-like stitching that ‘repairs’ it: an effect that implicates the razor sharp edges of the painted geometric forms with a sense of cruelty. The paper itself, thickened and stiffened by the layers of paint, has the consistency of animal hide, suggesting at once surgical laceration and leatherwork. This last effect is more fully emphasized in another work on paper that is literally dissected along its diagonals and incompletely sewn back together. An irregular anamorphic plane is also cut out of the dissected pink picture plane, painted red and again incompletely sewn back into place. When hanging on the wall, the bottom segment swings a fraction away from the wall, suspended off the work like a flap of loose leather or viscera. 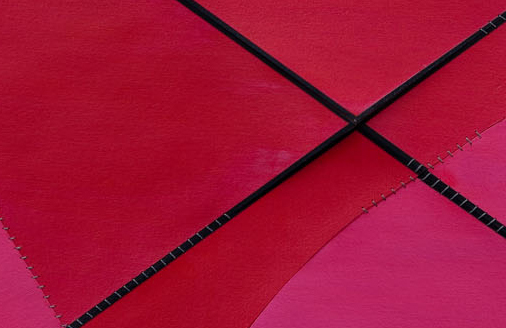 The centre of the work, where the cut diagonals cross, is also left unsewn, creating small flaps, beneath which a literal interior is vaguely glimpsed. Yet, as in the first work analyzed, the interior seems implied as a means of foreclosing the absolute nature of the picture plane. By showing us what is literally beneath the image, Khava confirms for us that we can only ever get behind the ‘canvas’, never behind the image. Perhaps because of the violence implied by its means, this strategy at first presents as a kind of cruel refusal, mocking the viewer with an offer of revelation that is itself a rebuff. But there is another possible reading, one that suggests that the works are made with a genuine desire to speak, a desire to reveal depth but within an awareness of its impossibility. Interpreted along these lines, the penetrations become invitations to perceive what cannot be seen, to listen for what cannot be spoken. There is also a further possible implication, derived from the highly disciplined formal severity of the surface, that the purity of formal means is itself that which forbids speech or renders it impossible. Seen in this light, the silence first perceived as an effect of this work becomes particularly the silence of the silenced. The muteness of the object is imposed upon it by the cruelty of formal rigor as an almost sadistic imperative. But this imperative is experienced not from the perspective of the sadist, but of the victim. Thus the conflicted nature of these much loved, unloving objects: the intense, sustained, and intimate care (often self effacing) with which they are made stands in rigid tension to their cold brilliance, unforgiving surface, and austere indifference to the viewer. The works so far discussed are extreme in the tendencies I am attempting to elucidate. While they are significant for the raw statement of their under-sublimated conflict, they should not be mistaken as indicative of the modulation of Khava’s oevre. Her development as an artist, it could be argued, tends toward a mitigation of this conflict, rendering it more subtle and understated, in a sense stating its silence more silently. This reading is supported by reference to another work, again on paper composing two light blue rectangles, each with a narrow rectangular slot cut neatly into its surface, one on the left side and the other on the right. A thin skein of thread is sewn across each slot, one red and one yellow. 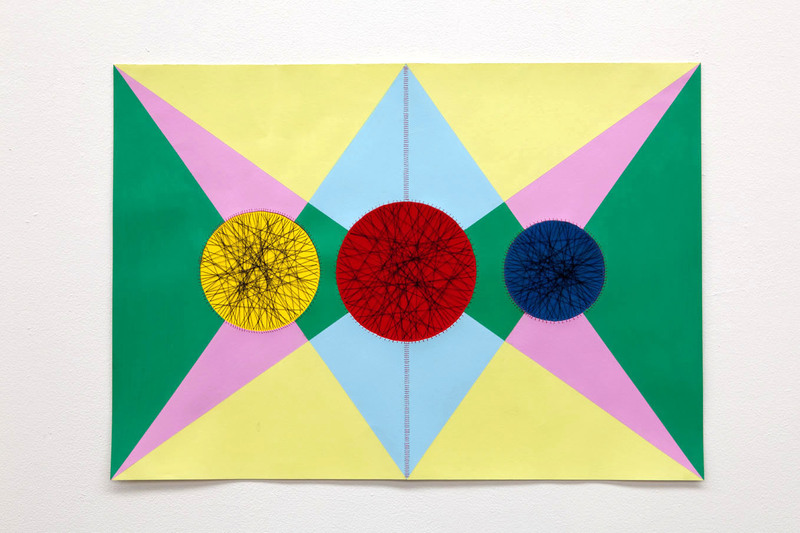 The overall effect is far more ‘cheerful’ than the previous works discussed: the light blue surface reacting in complement to the bright yellow and red thread, which rims the slot with a cushion of stitch work and softly veils its aperture. Also, the absence of converging diagonals helps to stabilize the image, relieving it of the sense of explicit irrationality of the works previously discussed. Yet, despite this more pleasing demeanor, the painting has lost none of its tension. The narrowness of the slits, the bright color of the thread and the softness it offers to the eye, both in the transparency of its skein, but also in the edging around the rim of the window, invites the viewer into the its intimate ambit, but only to trap it within the triple bind created by the veiling. At once covering over, revealing, and revealing nothing, this ‘window’ only emphasizes the flatness of the picture plane, the hardened materiality of its painted surface, and ultimately the inadequacy of the blue to remain ‘cheerful’ in concert with these more severe qualities and in competition with the brightness of the thread. Its promise of pleasure seduces the viewer towards the internal limit of that pleasure, drawing you up to that absolute boundary of desire, the picture plane. Not only is it impenetrable, but beyond it’s veil there is nothing but the banality of a wall. Without reducing the diversity of Khava’s artistic output to this singular statement, its concerns can be found to iterate across her oeuvre. The predominant use of paper, and an aversion to framing the work keeps it flat against the wall. When viewed from any distance, this reduces it ostensibly to the two dimensions of its picture plane, yet leaves it in paradoxical communication with the wall. What is literal and what is pictorial remain in open conflict. Her work, overall, tends toward the smaller scale, producing an intimacy that contradicts the hard edged content it asks the viewer, impossibly, to be intimate with. When Khava does work larger, it is through modular assemblage, often creating grids out of square serial works that draw pictorial continuities across the spaces between the individual frames; in other words creating a continuous picture plan that spans the literal gaps in it’s support, often creating forms that mimic or tease the form of those very gaps. This use of the grid is not uncommon in Khava’s oevre, and I suppose, given the nature of the work, not unexpected. The grid was after all originally a tool for translating literal three-dimensional reality onto a two dimensional plane that became itself a central object of modernist self-conscious concern. It’s role as medium between the pictorial and the literal made it a perfect object for abstract contemplation. Khava treats the grid with typical care, taking this impersonal, objective, and universalizing form and manifesting it’s geometric severity as a hand crafted, lovingly made object. This is perhaps most obvious when the artist strays from paper to stitch gold and silver thread grids onto four small square ‘samples’ of un-stretched canvas painted in subdued pink, grey, mustard and black. The works immediately deprive the canvas of its pretension as canvas, reducing it to the status of mere cloth and making the objects resonate toward the category of domestic needlework. Yet the form so embroidered on this “denuded” support is one of the central paradigms of universal modernism (some would argue it is modernism’scentral paradigm), and the contradiction between the highly personal, hand crafted object and its impersonal, abstract, and universalist subject matter is emphatic. In a sense, Khava is taking modernism personally. Far from the abstract universal rhetoric of high modernism, her work encounters the universal through the finite aperture of the individual, consistently invoking it through means that emphasize their corporeality and the conflict of sublimation that makes the relationship possible. On one level the subject exists in an almost symmetrical relationship to the universal form to which it is subjected, i.e. the formal severity of the work, its ordered, impassive beauty and pristine indifference, stands in almost inverse attitude to that of the subject– enthralled, supplicating, vulnerable: the lover of the much loved unloving object. Yet on another level, the subject is defiant, always transgressing the rule of order. By insisting on the imperfection of means and the finitude of the subject, the work defies the purity of form, and refuses its tendency to totalize toward the delusion of pure abstraction. From this perspective, the tension, cruelty, and even violence we have found implicit in this work, takes on a new dimension. The silence of the silenced becomes a teeth gritting defiance: its unspeaking nature assumes an edge of implacable refusal and defiance of the order to which it is enthralled. This contradiction defines and sustains the relationship between subject and object, holding it open in a tension that refuses to allow it to collapse: either the subject extinguished in its subjection to the object or the object consumed by the limitless desire of the subject. This single movement of attraction and resistance to the Other, seeks at once the ideal union between the two terms while insisting at the same time on the very real distance and difference between them. In other words, the artist endeavors to discover, impose, or imply order in the very same movement that she resists and transgresses it in a self-assertive gesture of liberation. Khava makes this relationship manifest by describing in her work, the love affair between the artist and the absolute as a running battle that is lost as soon as one side wins. For more images of this work, go to the INDEX. website. WHO’S AFRAID OF PUBLIC ART? The Colour for the Air.